Soccer warm up drills before game, or more fitness related practice, will require players to go through a more intense warm up session to prepare for whats to come. These warm up soccer drills are great to apply towards pre game soccer warm up. Players will start with a light jog for 5 min, after which they will move into more intense and fast paced warm up with, and without the soccer ball. This drill is one of my favorite warm up soccer drills that has a great impact on the player’s readiness for the game or practice. The purpose for this soccer warm up drill is to get the players heart rate, and core body temperature up, in preparation for the game or practice. This warm up drill can be done in groups of 2 players. To get the most out this pre game warm up drill, set up 2-3 different grids, allowing players to move from one activity to another without standing around and waiting for a turn. This soccer drill involves a slow tempo jog for 5 m/yd, followed by an activity for 10 m/yd, and than finishing off with 5 m/yd jog at the end. Place 4 cones in a straight line. First 2 cones will be 5 m/yd apart. Than 10 m/yd channel, followed by another 5 m/yd channel. 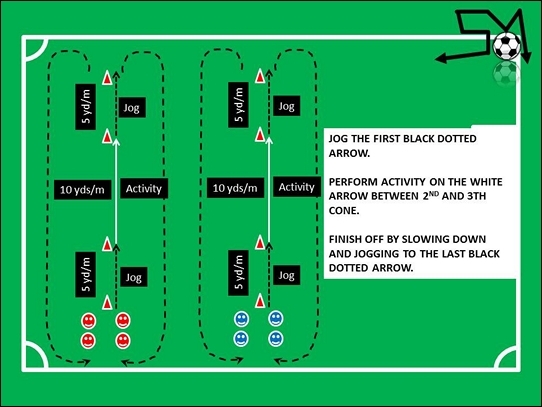 Players will pair up with a teammate, and take position at the first cone. Jog from first cone to the second cone at 50% pace. From the second to third cone (10 m/yd channel), perform an activity from the list below. Finish off by slowing down, and jogging for the last 5 yards/meters and back to the end of the line. This soccer drill can be modified with different activities inside the 10 yd/m area of the grid to keep the drill new and fresh. Players will focus on the correct technique, rather than speed of execution. Having several grids set up will allow the players to perform different activities on different grids (ex. One grid has the Back Pedaling and the grid next to it has the Accelerated Run activity… this will allow players to perform the drill on one grid, and move on to the next one). 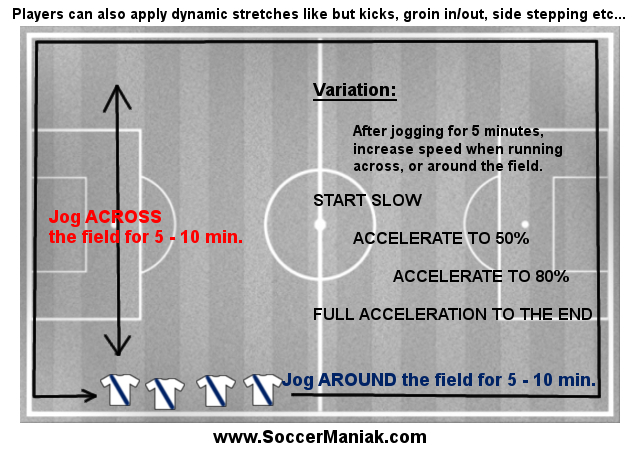 Spend 5 – 20 min on this soccer warm up drill. Coaches job is to correct any wrong technique that the players may be displaying. Soccer warm up drills before game should be done with dynamic stretches before intensifying warm up and adding the soccer ball for players to kick.